The media event launched by Barb Carey five years ago, the Women Ice Angler Project (WIAP), shines the spotlight on women ice anglers throughout the ice belt. During several days on the ice, WIAP offers the sportfishing industry and WIAP sponsors media coverage highlighting strong female ice anglers. In 2019, from January 23-27, #womenonice will address finding empowerment through facing fears. The pursuit of living life to its fullest is their passion. 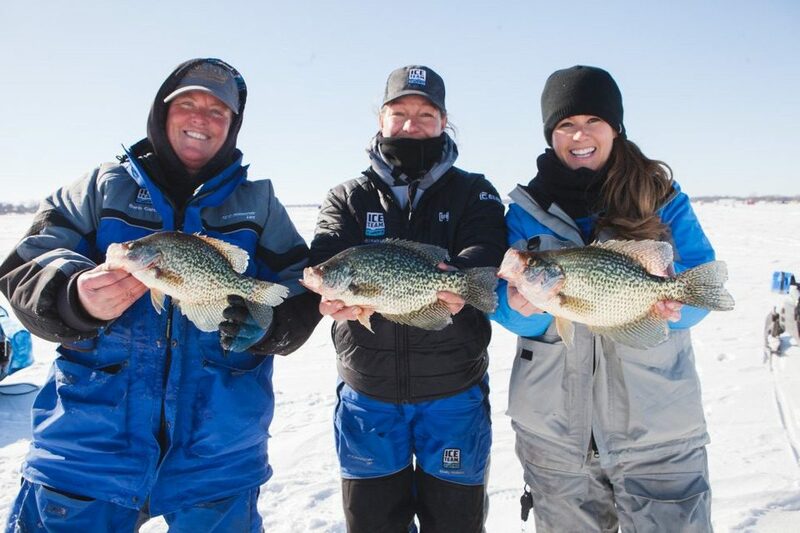 Photos: Shelly Holland with the biggest crappie of the day; Shantel Wittstruck with another nice crappie; mobility on the ice was the key to the day; dialed in some nice bluegills; fun for the WIAP ladies; Orion coolers kept the drill batteries warm and full-powered; Rikki Pardun with a big slab crappie. The topic of finding empowerment through facing fears hits close to home to this nine-woman team, as teammate Hannah Stonehouse Hudson lost her husband, Jim Hudson, six years ago. Hudson died from a thin-ice accident January 26, 2013. WIAP will be back to the same location and over the same dates in 2019. “Since the moment my husband passed away, my focus in life has been to help others address their fears and move forward from loss with the lessons they have learned from their loved ones,” Hannah said. “Returning to the body of water where Jim taught me to fish, with the group of women who encouraged me to keep fishing after Jim’s death is full circle for me, especially with the dates we will be filming. This trip, for me, is all about addressing our fears and living life to the fullest”. WIAP 2019 anglers included founder and pro-staff ice angler Barb Carey plus pro-staff anglers Shelly Holland, Bonnie Timm, Shantel Wittstruck, Rikki Pardun; Hannah Stonehouse Hudson and Krissie Mason (outdoor writers and photographers) as well as outdoor writer Kristine (K.J.) Houtman. Project sponsors include Fleet Farm, Blackfish, Clam Outdoors, Jiffy, Outdoor First Media, Larry Smith Outdoors, Grass Fed Media, Fish On Kids Books, Stonehouse Photography, Scratch+Holler, WI Women Fish, The Woman Angler and Adventurer, and local hosts Mission Springs Resort.